It has been a busy, crazy couple of weeks for me…which can all be summed up by the fact that all the photos I have taken of my quilts and things I have been doing were on a SD card which got corrupted. I had photos of my quilt at Sisters Outdoor quilt show…photos of my works in progress and photos of the Kids quilt class I taught last week. All gone. This week I finally finished my Portland Modern Quilt Guild medallion quilt. 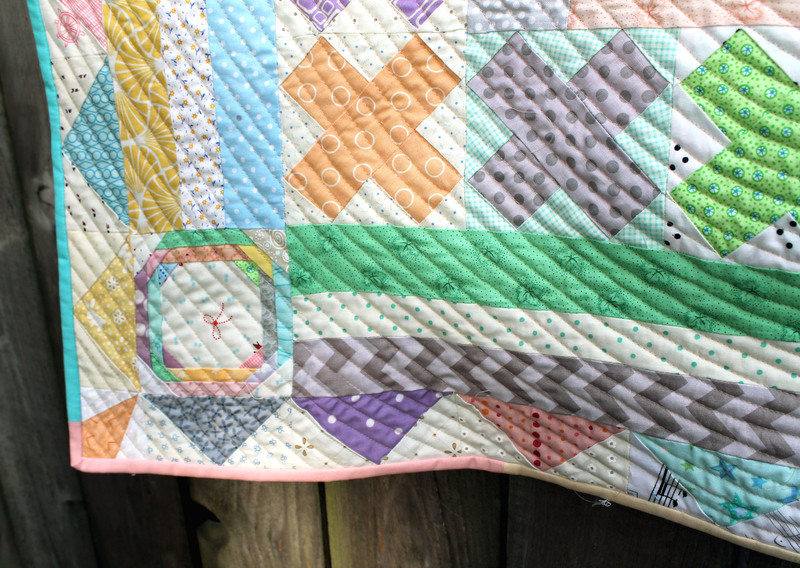 Now to t be honest with you I did not do all the borders that I was meant too… partly because I wanted this quilt to be baby size and partly because I got bored with the pastel colour scheme! If you are interested in the pattern and process you can check out my earlier post about the quilt…which includes links to the free patterns we used. To finish off my quilt I decided to do my first lot of circular quilting… using the walking foot on my new Bernina 550. I thought that circular quilting would be perfect with this quilt so I started in the center of the quilt and worked my way out. Now if I am honest with you the center quilting was a little tricky. I took the above photo so you could see just how wonky I was at the start… I did end up unpicking quite a few of my stitches as they were so off kilter and I went back into the center using free motioning quilting (no walking foot) to get the center right. 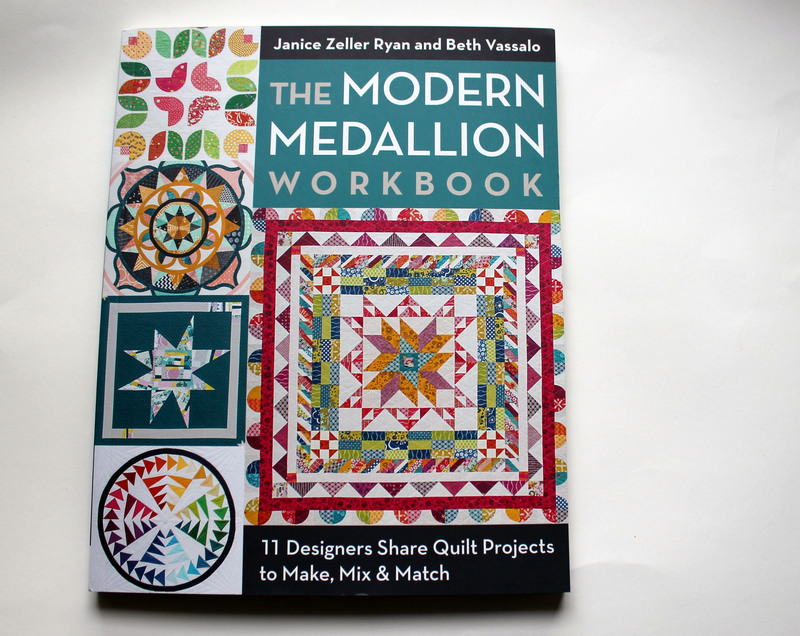 I kid you not, I took delivery of this book just moments after finishing my Medallion and I am now inspired to make another one…. this time not in pastel and this time maybe a little more modern. 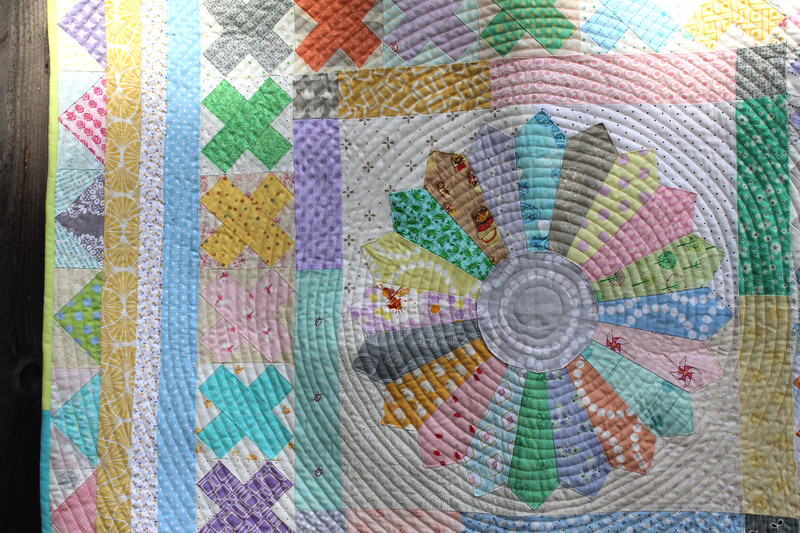 Love the circular quilting. I saw it on a quilt at the very first quilt show I went to in New Zealand and thought it was wonderful. Still love it! I loved the look of it too but had not been game enough to try it until now. Love the circular quilting, I saw it at the first quilt show I ever went to in New Zealand years ago and still love it as much. Technology is marvellous until it isn’t. My sympathies about the SD card. And that is a smashing quilt, and the circular quilting looked fine until you pointed out the middle! In my defense I have fixed the middle….lol. I know how you feel — my camera was stolen once, full of photos. Another time I was working on a video presentation I’d been hired to do and with just one click, hours of video were deleted. It’s terribly disappointing! But on the other hand, your quilt is so pretty, and I love the quilting. It adds a whole new look to it. 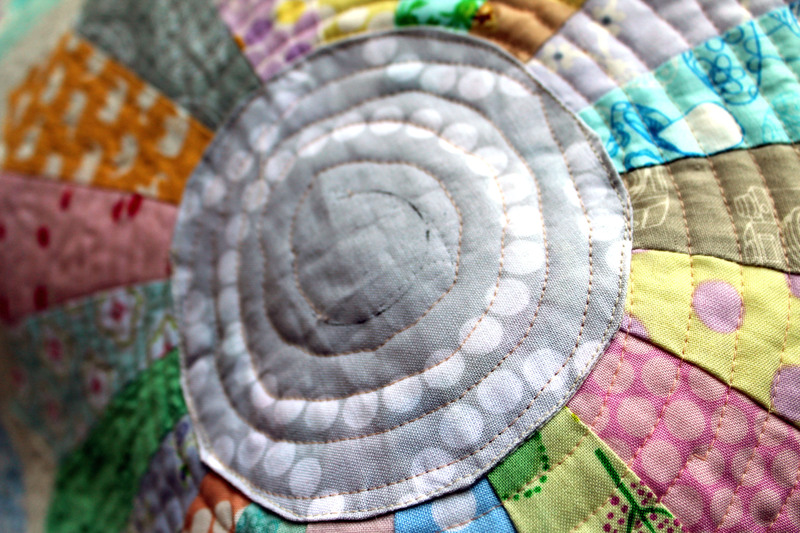 Oh I love the circular quilting, it really suits the quilt and it must be rather meditative just going around and around! Don’t give up on those photos! I managed to recover hundreds of deleted pictures on a corrupted card once using a free programme I found online. I don’t remember what it was but it’s worth a search. You have nothing to lose! 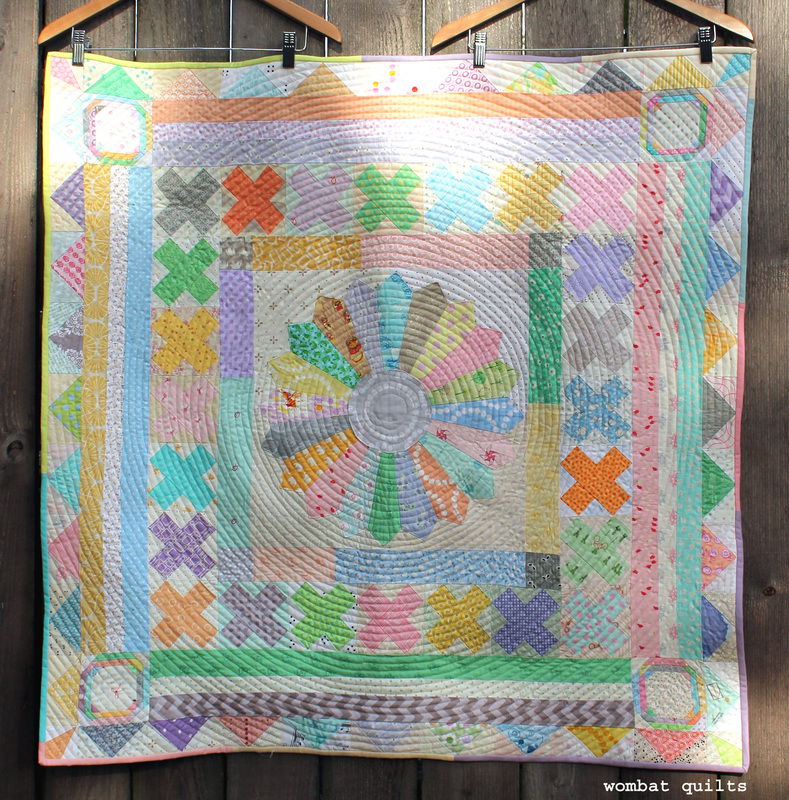 The quilt is adorable and I definitely want to try that circular quilting sometime! Love the quilting! Awful that you lost your photos. I am drooling. Love Dresdens, and yours is no exception. Such yummy delicious colours. Well done on your circular quilting. It looks great ! My condolences on the SD card. Your quilt is lovely. I’m not a big fan of medallions OR pastels but this looks exceptional. 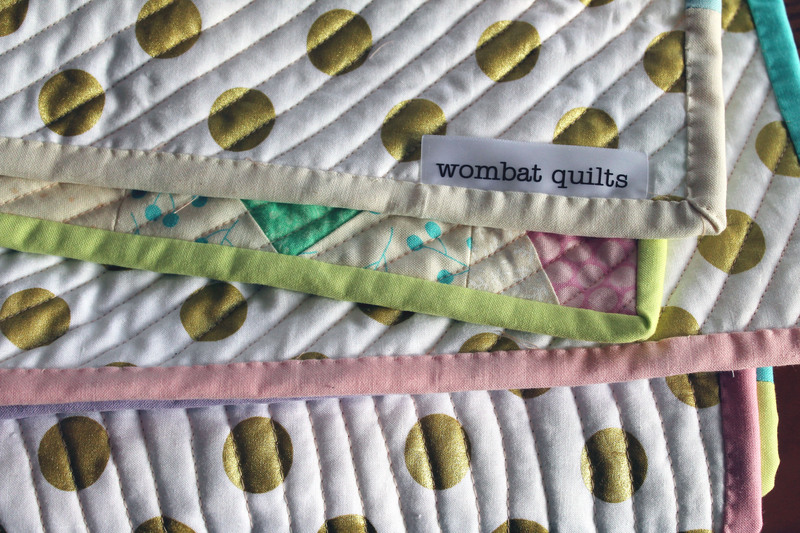 I’ve done circular quilting a few times … each time swearing I’ll never do it again. lol But even a ‘not so great’ effort always looks great so I supposed that’s why I keep returning to it. I’ve yet to work up the nerve to try using FMQ for the center although I know in my heart that is the answer. I look forward to seeing your next version. You did a wonderful job with the pastels, and it is such a sweet baby quilt! That workbook looks really neat, I will have to check it out. Sorry to hear of the corrupted SD card! Losing so many pictures is devastating! I love the pastel colour scheme, even though you are on the fence about it. This also makes me want to try circular quilting with the next suitable project. Great work. Pooh to more modern! I love tis one, which is not all that pastel. I once did similar circular quilting, and vowed never again because of the mountain in the middle (where I’d started, as you do). Viv did you start in the middle when you quilted or did you work into the middle? started in the middle!, as I always do. 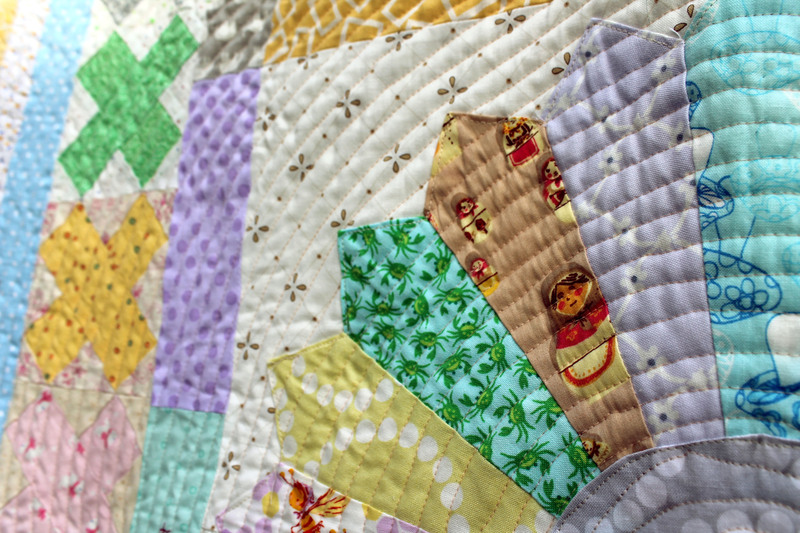 I love the quilt, the fabric, the quilting… Everything! This would so be me!